Quirky and filled with surprises, The Sisters Brothers is a throwback western that, like such recent oaters as Damsel and the Coen Brothers’ The Ballad of Buster Scruggs, plays like it was made in another era—the 1970s to be precise, where it fits nicely with such revisionist gems as McCabe and Mrs. Miller and The Hired Hand. 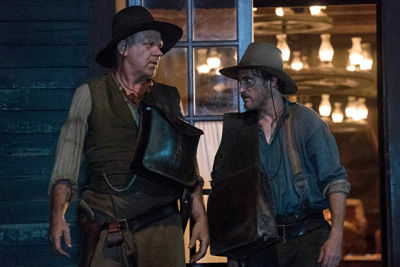 The title characters are Eli (John C. Reilly, Carnage, Cyrus)and Charlie Sisters (Joaquin Phoenix, I’m Still Here), two guns-for-hire siblings during the mid-1800s. Enlisted by a mysterious mobster (Rutger Hauer, Hobo with a Shotgun) to hunt down a thieving foreign prospector (Riz Ahmed, Nightcrawler) with an expertise in chemistry, the assassins join John Morris (Jake Gyllenhaal, Southpaw), an educated detective, out to procure the crook. The first English-language film by French director Jacques Audiard, The Sisters Brothers is much different from his previous work, serious fare like the award-winning A Prophet and Dheepan. Here the focus is on offbeat humor and the chemistry between the characters, particularly the alcoholic Charlie and the more grounded Eli. And while their squabbling makes for some humorous moments, the threat of violence is not far away. Add the eccentricities of Ahmed’s gold miner—a former dentist—and Gyllenhaal’s overly articulate lawman, and you have a quartet of wild cards on an unpredictable journey that takes them from lush Oregon to crowded, colorful San Francisco in the Gold Rush heyday. 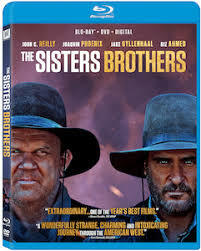 Along with its top-notch cast and unconventional casting and storyline, The Sisters Brothers looks great and feels authentic, aided by a fine, atmospheric score by Oscar winning Alexandere Desplat (The Ghost Writer) and striking cinematography supplied by Benoit Debie (Spring Breakers). The film peaked at $3.2 million in theaters last year before a quick exit despite positive word-of-mouth –and an 85% positive score on Rotten Tomatoes– could sink in. Its prospects are more positive at home as it will delight sagebrush saga enthusiasts seeking dark humor amidst all of the dust and the danger.